آلن استرن (به انگلیسی: Alan Stern) زادهٔ ۲۲ نوامبر ۱۹۵۷ در نیواورلئان، لوئیزیانا، یک دانشمند سیاره‌شناسی اهل ایالات متحده آمریکا است. او پژوهشگر اصلی مأموریت نیوهورایزنز (مأموریتی به سوی پلوتو است. Sol Alan Stern (born November 22, 1957) is an American engineer and planetary scientist. He is the principal investigator of the New Horizons mission to Pluto and the Chief Scientist at Moon Express. Stern has been involved in 24 suborbital, orbital, and planetary space missions, including eight for which he was the mission principal investigator. One of his projects was the Southwest Ultraviolet Imaging System, an instrument which flew on two space shuttle missions, STS-85 in 1997 and STS-93 in 1999. Stern has also developed eight scientific instruments for planetary and near-space research missions and has been a guest observer on numerous NASA satellite observatories, including the International Ultraviolet Explorer, the Hubble Space Telescope, the International Infrared Observer and the Extreme Ultraviolet Observer. Stern was Executive Director of the Southwest Research Institute's Space Science and Engineering Division until becoming Associate Administrator of NASA's Science Mission Directorate in 2007. He resigned from that position after nearly a year. In early 2009 Stern's name was mentioned as a potential contender for the position of NASA administrator under President Obama's administration. Stern has stated, however, that he is not interested in the position at this time given his desire to spend time with his family. Stern was born in New Orleans, Louisiana, the son of Joel and Leonard Stern. He graduated from St. Mark's School of Texas in 1975. He then attended the University of Texas, Austin, where he received his bachelor's degrees in physics & astronomy and his master's degrees in aerospace engineering and planetary atmospheres. He earned a doctorate in astrophysics and planetary science from the University of Colorado, Boulder. From 1983 to 1991, Stern held positions at the University of Colorado in the Center for Space and Geoscience Policy, the office of the Vice President for Research, and the Center for Astrophysics and Space Astronomy. He received his doctorate in 1989. From 1991 to 1994 he was the leader of Southwest Research Institute's Astrophysical and Planetary Sciences group and was Chair of NASA's Outer Planets Science Working Group. From 1994 to 1998 he was the leader of the Geophysical, Astrophysical, and Planetary Science section in Southwest Research Institute's Space Sciences Department, and from 1998 to 2005 he was the Director of the Department of Space Studies at Southwest Research Institute. In 1995 he was selected to be a Space Shuttle mission specialist finalist and in 1996 he was a candidate Space Shuttle payload specialist but did not have the opportunity to fly on the Space Shuttle. His research has focused on studies of our solar system's Kuiper belt and Oort cloud, comets, the satellites of the outer planets, Pluto, and the search for evidence of planetary systems around other stars. He has also worked on spacecraft rendezvous theory, terrestrial polar mesospheric clouds, galactic astrophysics, and studies of tenuous satellite atmospheres, including the atmosphere of the Moon. In 2007, Stern was listed among Time magazine's 100 Most Influential People in The World. On August 27, 2008 Stern was elected to the Board of Directors of the Challenger Center for Space Science Education. In 2015, Stern was the recipient of Smithsonian Magazine's American Ingenuity Award in the Physical Sciences category. On October 7, 2016, Stern was inducted into the Colorado Space Hall of Fame. 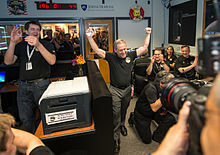 Alan Stern and the New Horizons team celebrate after the spacecraft successfully completed its flyby of Pluto. I recall going to JPL, the Jet Propulsion Lab, the summer of 1989 when I was in graduate school to take a summer course in planetary exploration at Caltech and this was the summer of the Voyager fly-by of Neptune and Triton (which has turned out to be rather a twin of Pluto). It was amazing to get to be a part of some first-time exploration like that! Within a matter of months, a small group of us had formed a team, an advocacy group, Why don't we get a mission together for Pluto? After completing a master's degree in aerospace engineering Stern spent seven years as an aerospace systems engineer, concentrating on spacecraft and payload systems at the NASA Johnson Space Center, Martin Marietta Aerospace, and the Laboratory for Atmospheric and Space Physics at the University of Colorado. I am a fan of public-private partnerships and building bridges to new markets, I believe we are on the verge of a whole new era of space exploration and that the private sector can provide reliable cost effective services that can increase the value and leverage government space budgets. On June 18, 2008, Stern joined Odyssey Moon Limited (Isle of Man), a private industry effort, as a part-time Science Mission Director/consultant in their efforts to launch a robotic mission to the Earth's Moon by participating in the $30 Million Google Lunar X-Prize competition. In December 2008, Stern joined Blue Origin, a company that was founded by Amazon.com's Jeff Bezos as an independent representative for research and education Missions. The company has stated that its objective is to develop a new vertical-take-off, vertical-landing vehicle known as New Shepard that is designed to take a small number of astronauts on a sub-orbital journey into space and reduce the cost of space transportation. The company is located in Kent, Washington and has flight tested some hardware. In 2012, Stern co-founded Uwingu. Stern has extensive experience in instrument development, with a strong concentration in ultraviolet technologies. Stern is a principal investigator (PI) in NASA's UV sounding rocket program, and was the project scientist on a Shuttle-deployable SPARTAN astronomical satellite. He was the PI of the advanced, miniaturized HIPPS Pluto breadboard camera/IR spectrometer/UV spectrometer payload for the NASA/Pluto-Kuiper Express mission, and he is the PI of the PERSI imager/spectrometer payload on NASA's New Horizons Pluto mission. Stern is also the PI of the ALI CE UV Spectrometer for the ESA/NASA Rosetta comet orbiter. He was a member of the New Millennium Deep Space 1 (DS1) mission science team, and is a Co-investigator on both the ESA SPICAM Mars UV spectrometer launched on Mars Express, and the Hubble Space Telescope Cosmic Origins Spectrograph (COS) installed in 2009. He is the PI of the SWUIS ultraviolet imager, which has flown two Shuttle missions, and the SWUIS-A airborne astronomical facility. In this capacity, Stern has flown numerous WB-57 and F-18 airborne research astronomy missions. Stern and his colleague, Dr. Daniel Durda, have been flying on the modified F/A-18 Hornet with a sophisticated camera system called the Southwest Ultraviolet Imaging System (SWUIS). They use the camera to search for a hypothetical group of asteroids (Vulcanoids) between the orbit of Mercury and the Sun that are so elusive and hard to see that scientists are not sure they exist. This is not pilot training. Its aircraft systems, egress training, communications. It's really how to live aboard the aircraft and help the pilot as required. The backseater has a checklist to do. I won't pretend that I am landing the plane at night. I have got stick time on the airplanes and I've been flying airplanes for 20 years, but let's not pretend I am the pilot here. Stern has served on various NASA committees, including the Lunar Exploration Science Working Group (LExSWG) and the Discovery Program Science Working Group (DPSWG), the Solar System Exploration Subcommittee (SSES), the New Millennium Science Working Group (NMSWG), and the Sounding Rocket Working Group (SRWG). He was Chair of NASA's Outer Planets Science Working Group (OPSWG) from 1991 to 1994 and served as a panel member for the National Research Council's 2003-2013 Decadal survey on planetary science. Stern is a member of the AAAS, the AAS, and the AGU. Stern was appointed NASA's Associate Administrator for the Science Mission Directorate, essentially NASA's top-ranking official for science, in April 2007. In this position Stern directed a US$4.4 billion organization with 93 separate flight missions and a program of over 3,000 research grants. During his tenure a record 10 major new flight projects were started and deep reforms of the research and also the education and public outreach programs were put in place. Stern's style was characterised as "hard-charging" as he pursued a reform-minded agenda. He "made headlines for trying to keep agency missions on schedule and under budget" but faced "internal battles over funding". He was credited with making "significant changes that have helped restore the importance of science in NASA's mission". On March 26, 2008 it was announced that Stern had resigned his position the previous day, effective April 11. He was replaced by Ed Weiler, who was to serve his second stint in the position. The resignation occurred on the same day that NASA Chief Michael D. Griffin overruled a decrease in funding for the Mars Exploration Rovers and Mars Odyssey missions that was intended to free up funds needed for the upcoming Mars Science Laboratory. NASA officials would neither confirm nor deny a connection between the two events. Stern left to avoid cutting healthy programs and basic research in order to cover cost overruns. He believed that cost overruns in the Mars program should be accommodated from within the Mars program, and not taken from other NASA programs. Michael D. Griffin became upset with Stern for making major decisions without consulting him, while Stern was frustrated by Griffin's refusal to allow him to cut or delay politically sensitive projects. Griffin favored cutting "less popular parts" of the budget, including basic research, and Stern's refusal to do so led to his resignation. On November 23, 2008, in an op-ed in The New York Times, Stern criticized NASA's inability to keep its spending under control. Stern said that, during his own time at NASA, "when I articulated this problem... and consistently curtailed cost increases, I found myself eventually admonished and then neutered by still higher ups, precipitating my resignation earlier this year." While complimenting current NASA Administrator Michael D. Griffin, Stern suggested that Griffin's decision to again bail out an over-budget mission was motivated by fear "that any move to cancel the Mars mission would be rebuffed by members of Congress protecting local jobs". Since leaving NASA, Stern has made constructive criticisms of the budgetary process and has advocated for revamping its public appeal. Stern has become particularly involved in the debate surrounding the 2006 definition of planet by the IAU. After the IAU's decision was made he was quoted as saying "It's an awful definition; it's sloppy science and it would never pass peer review" and claimed that Earth, Mars, Jupiter and Neptune have not fully cleared their orbital zones and has stated in his capacity as PI of the New Horizons project that "The New Horizons project [...] will not recognize the IAU's planet definition resolution of August 24, 2006." A 2000 paper by Stern and Levison proposed a system of planet classification that included both the concepts of hydrostatic equilibrium and clearing the neighbourhood used in the new definition, with a proposed classification scheme labeling all sub-stellar objects in hydrostatic equilibrium as "planets" and subclassifying them into "überplanets" and "unterplanets" based on a mathematical analysis of the planet's ability to scatter other objects out of its orbit over a long period of time. Mercury, Venus, Earth, Mars, Jupiter, Saturn, Uranus and Neptune were classified as neighborhood-clearing "überplanets" and Pluto was classified as an "unterplanet". One could take this classification system as planet and dwarf planet respectively, with the major difference of the IAU definition classifying the two as distinct categories of celestial bodies instead of two subsets of planets. Some large satellites are of similar size or larger than the planet Mercury, e.g. Jupiter's Galilean moons and Titan. Stern has argued that location should not matter and only geophysical attributes should be taken into account in the definition of a planet, and proposes the term satellite planet for a planet-sized object orbiting another planet. Likewise planet-sized objects in the asteroid belt or Kuiper belt should also be planets according to Stern. Others have used the neologism planemo (planetary-mass object) for the broad concept of "planet" advocated by Stern. Stern, S. Alan (1987). The U.S. Space Program After Challenger. New York: Franklin-Watts. ISBN 0-531-10412-5. Stern, S. Alan, ed. (1998). Our Worlds: The Magnetism and Thrill of Planetary Exploration. Cambridge University Press. ISBN 0-521-63164-5. Stern, S. Alan, ed. (2000). Our Universe. Cambridge University Press. Stern, S. Alan, ed. (2003). Worlds Beyond: The Thrill of Planetary Exploration as told by Leading Experts. Cambridge University Press. ISBN 0-521-52001-0. Stern, S. Alan (April 2013). "The low-cost ticket to space". Space Exploration. Scientific American. 308 (4): 50–55. Stern, S. Alan; Mitton, Jacqueline (2005) . Pluto and Charon: Ice Worlds on the Ragged Edge of the Solar System. John Wiley and Sons. ISBN 3-527-40556-9. Stern, Alan; Grinspoon, David (2018). Chasing New Horizons: Inside the Epic First Mission to Pluto. Picador. ISBN 978-1-2500-9896-2. ^ "365 days: Nature's 10". Nature. 528 (7583): 459–467. 2015. doi:10.1038/528459a. ISSN 0028-0836. OCLC 1076418075. ^ "Dr. Alan Stern named Chief Scientist for Moon Express". Solar System Exploration Research Virtual Institute. Retrieved January 9, 2019. ^ "Moon Express Announces Dr. Alan Stern as Chief Scientist". Moon Express. Space Ref. July 20, 2011. Retrieved January 9, 2019. ^ a b "Associate Administrator for the Science Mission Directorate S. Alan Stern". April 2, 2007. Retrieved January 9, 2019. ^ a b "Dr. S. Alan Stern". Archived from the original on September 7, 2008. Retrieved April 9, 2009. ^ Who Will Be the Next NASA Administrator? ^ Brian Berger and Becky Iannotta (January 8, 2009). "Earth Scientist Emerges as Possible Replacement for NASA Chief". Retrieved January 9, 2019. ^ a b Jeff Foust (March 25, 2009). "And then there were… none?". Space Politics. Retrieved January 9, 2019. ^ Jeffrey Kluger (May 3, 2007). "Alan Stern". Retrieved January 9, 2019. ^ "2015 American Ingenuity Award Winners". Smithsonian Magazine. Smithsonian. Retrieved January 9, 2019. ^ Brevard Business News. "Foundation names honoree for Colorado Space Hall of Fame, event set for Oct. 7", vol. 34, no. 34, (Melbourne, Florida: 22 August 2016), p. 7. ^ Doug Messier (December 8, 2008). "Alan Stern, Blue Origin Man". Retrieved January 9, 2019. ^ "Got a Name for a Crater on Mars? You Can Put It on Uwingu's List". NBC News. February 26, 2014. Retrieved January 9, 2019. ^ "Missions - Spartan 201". NASA Science. NASA. Retrieved January 9, 2019. ^ "SWUIS Story and Project Background". Retrieved January 9, 2019. ^ "Solar System Exploration". Retrieved January 9, 2019. ^ "New Frontiers in the Solar System: An Integrated Exploration Strategy". Washington, D.C.: The National Academies Press. 2003. doi:10.17226/10432. ^ a b Eric Hand (August 3, 2008). "NASA science chief resigns". Nature. eISSN 1476-4687. ISSN 0028-0836. ^ a b Frank Morring, Jr. (March 26, 2008). "NASA science chief Alan Stern resigns". Aviation Week. Archived from the original on May 21, 2011. Retrieved March 26, 2008. ^ a b Brian Berger (March 26, 2008). "Weiler to replace Stern as NASA science chief". Space.com. Retrieved March 26, 2008. ^ Warren E. Leary (January 1, 2008). "Wielding a Cost-Cutting Ax, and Often, at NASA". The New York Times. The New York Times Company. Retrieved January 9, 2019. ^ Mark Matthews (March 26, 2008). "Alan Stern has left the (NASA) building". Orlando Sentinel. Archived from the original on April 3, 2008. Retrieved March 26, 2008. ^ a b "Planetary Exploration Newsletter: NASA Science Mission Directorate Update - Alan Stern, Associate Administrator/SMD". August 22, 2007. Retrieved January 9, 2019. ^ Mat Kaplan (March 26, 2008). "Planetary Society statement on Alan Stern's resignation from NASA". Planetary Society. Retrieved January 9, 2019. ^ Warren E. Leary (March 27, 2008). "NASA's Science Chief Resigns". The New York Times. The New York Times Company. Retrieved January 9, 2019. ^ a b Brian Berger (March 26, 2008). "An interview with NASA's next science chief". Space.com. Retrieved January 9, 2019. ^ "Ed Weiler becomes NASA's science chief". United Press International. May 8, 2008. Retrieved January 9, 2019. ^ Kate Tobin (March 24, 2008). "Mixed signals from NASA about fate of Mars rover". CNN. Retrieved January 9, 2019. ^ Will Dunham (March 26, 2008). "NASA science chief resigns post suddenly". Reuters. Retrieved January 9, 2019. ^ Alan Stern (November 23, 2008). "NASA's Black Hole Budgets". The New York Times. The New York Times Company. Retrieved January 9, 2019. ^ S. Alan Stern (November 24, 2008). "The Space Review: Imagine reconnecting NASA". Retrieved January 9, 2019. ^ Paul Rincon (August 25, 2006). "Pluto vote 'hijacked' in revolt". BBC News. Retrieved January 9, 2019. ^ Alan Stern (September 6, 2006). "Unabashedly Onward to the Ninth Planet". The PI's Perspective. New Horizons Web Site. Retrieved January 9, 2019. ^ Stern, S. Alan; Levison, Harold F. (2002). "Regarding the criteria for planethood and proposed planetary classification schemes" (PDF). Highlights of Astronomy. 12: 205–213, as presented at the XXIVth General Assembly of the IAU–2000 [Manchester, UK, August 7–18, 2000]. Bibcode:2002HiA....12..205S. ^ Should Large Moons Be Called 'Satellite Planets'? ^ G. Basri & E.M. Brown, 2006. Annual Review of Earth and Planetary Sciences, 34: 193–216. این صفحه آخرین‌بار در ‏۳۱ مارس ۲۰۱۸ ساعت ‏۲۳:۴۰ ویرایش شده‌است.